Drawing on nearly four decades of experience, Heritage Fence Company will work with you to ensure the safety of your backyard pool, with fences designed expressly for that purpose. We guarantee that our fences will meet the very specific requirements of the U.S. Pool Regulation Code. Almost any style of fence (aluminum, PVC, wood picket, and wood post and rail) can meet pool code specifications. In recent years, aluminum and PVC fences have become the most popular materials for pool fences because they last the longest. After more than thirty years of installing pool fences and adapting to the changing safety code, we can offer you some wisdom about the best and most durable pool fences. Below, we’ve listed some of our recommended styles of aluminum, PVC, and wood fences. Keep in mind that there are several other factors involved in planning your pool fence, including the gate specifications and the layout of your property. Please call or email us so we can draw up a plan and an estimate for you. Aluminum fences are a great choice for a pool because they require no maintenance and last for decades. They also won’t rust, despite humidity from the pool. 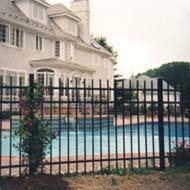 The “Derby,” “Storrs,” and “Essex” styles of aluminum fence are our most functional and popular pool fences. The Derby style simply needs to be at least 4′ to meet pool code, and the Storrs and Essex styles need to be at least 54″. In addition, the Essex style’s lowest rail must be flush with the ground, as pictured in the photo below, right. A durable PVC fence is another great choice for your pool. Both picket styles and privacy styles of PVC fences will work for pool enclosures. Both privacy and picket fences need to be at least 4′ high. If there are more than two rails (horizontal elements), there is also a limit to the size of the gap between pickets. All three of the fences below meet this code. Wood fences (both picket and post and rail) are the most economical option for pool fencing. Picket fences must be at least 4′ high and the gaps between pickets must be less than 1½”. Post and rail fences need to be at least 4′ high, but they also need to have B.O.C.A. Code wire stapled to the fence around the exterior.